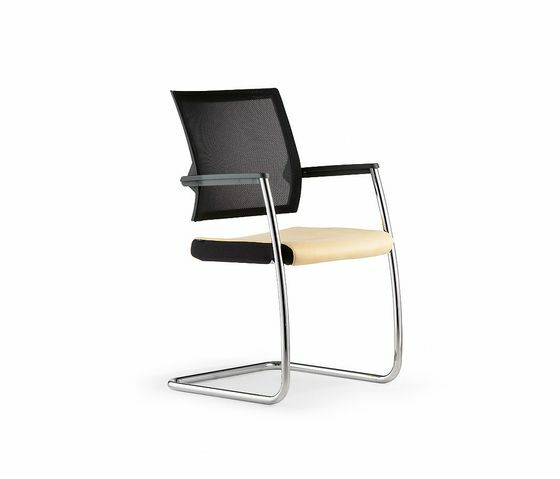 Cantilever conference chair due46, 3D mesh backrest, chrome-plated frame. Stackable 1+4. Visibly comfortable, Duera redefines the curve as a functional feature and can be operated intuitively. The 3D mesh gives the backrest an individual hold, optionally available with padding. Klöber Duera24 – excellent for 24-hour use. Workstations that are occupied 24 hours a day, seven days a week, 365 days a year need office swivel chairs that meet the highest demands. In terms of both load capacity and adaptability. Klöber Duera24 is the ideal solution for round-theclock workplaces. Whether tall or short, slim, broad, light or heavy, every user will experience maximum comfort and support. Valuable Roots Klöber has its origins in the pioneering spirit of the 1930s.